Before the invention of modern spectroscopic techniques such as mass spectrometry, the only way a chemist could determine the presence of a particular element or organic functional group was to carry out a chemical test and observe the results. At GCSE and A Level there are a series of chemical tests that you need to know. 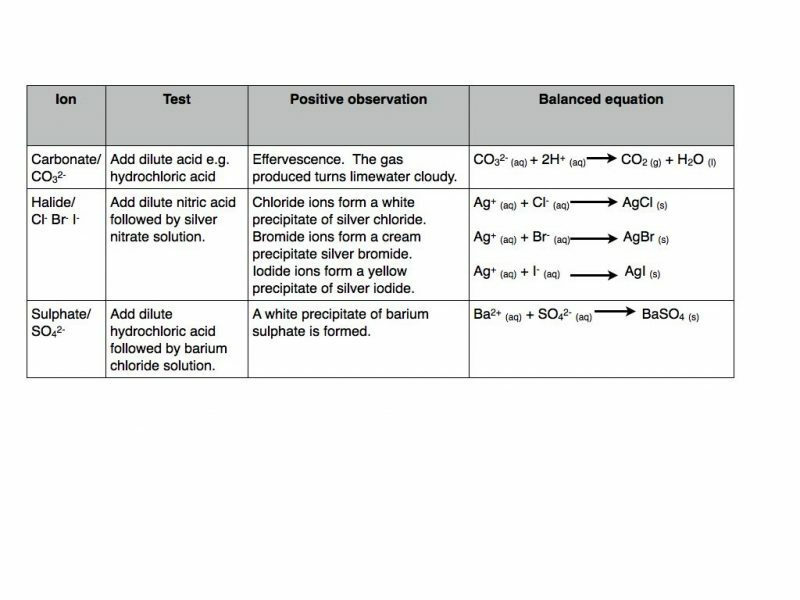 Some of the chemical tests in the GCSE syllabus are not present at A Level, but any self-respecting A Level Chemistry student should know them all. There are a series of simple chemical tests for the presence of certain gases. The required information is summarised in the table below. Flame tests are used to confirm the presence of particular metal ions in a compound. A small sample of the compound is heated in the blue Bunsen burner flame. Electrons in the metal gain energy and move to higher energy levels or orbitals. When these “excited” electrons lose energy and fall down to a lower energy level they release energy in the form of electromagnetic radiation. Some of the wavelengths of energy emitted are in the visible part of the electromagnetic spectrum and appear as a characteristic colour. The colour is in fact the combination of a number of different wavelengths. 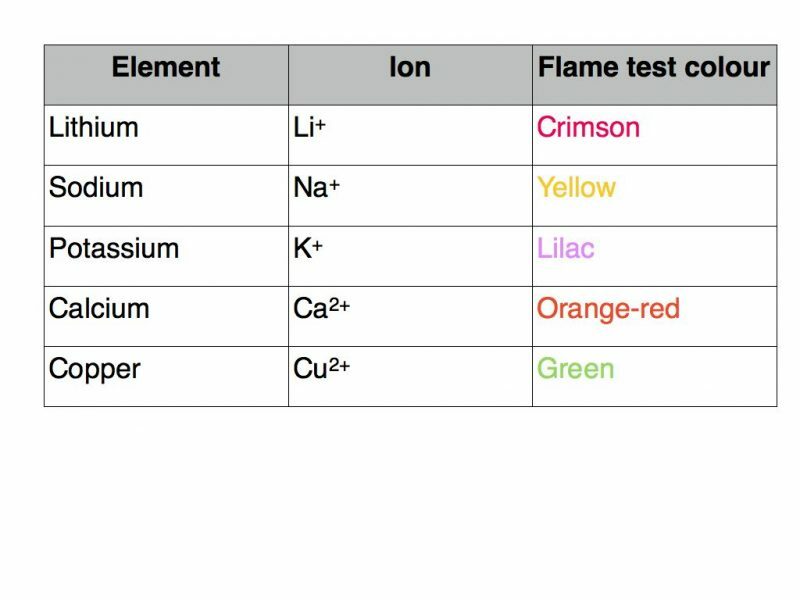 The elements and corresponding flame test colours that you are required to know are listed below. It is very important that the sample is pure otherwise the flame colour may be obscured by the presence of colours from other elements. Some metal ions form coloured precipitates of the corresponding metal hydroxide when sodium hydroxide solution is added. You need to be able to write balanced chemical equations for the formation of these metal hydroxides. The required information is summarised in the table below. You need to be able to recall the qualitative tests for the presence of carbonate, halide and sulphate ions in solution. The carbonate ion will react with dilute acids to produce carbon dioxide gas. The presence of carbon dioxide can then be confirmed by using limewater. The halides (group VII ions) can be identified using silver nitrate solution. The sample is first treated with dilute nitric acid solution to remove hydroxide and carbonate ions which would give a false positive result. Dilute silver nitrate solution is then added and the colour of the precipitate formed will indicate which halide is present. Please note that fluoride ions do not form a precipitate therefore this test is limited to chloride, bromide and iodide ions. To test for the sulphate ion the sample is first treated with dilute hydrochloric acid to remove carbonate ions which would give a false positive result. The sample is then treated with barium chloride solution. A white precipitate of barium sulphate is formed if sulphate ions are present. The table below summarises all the tests and observations. 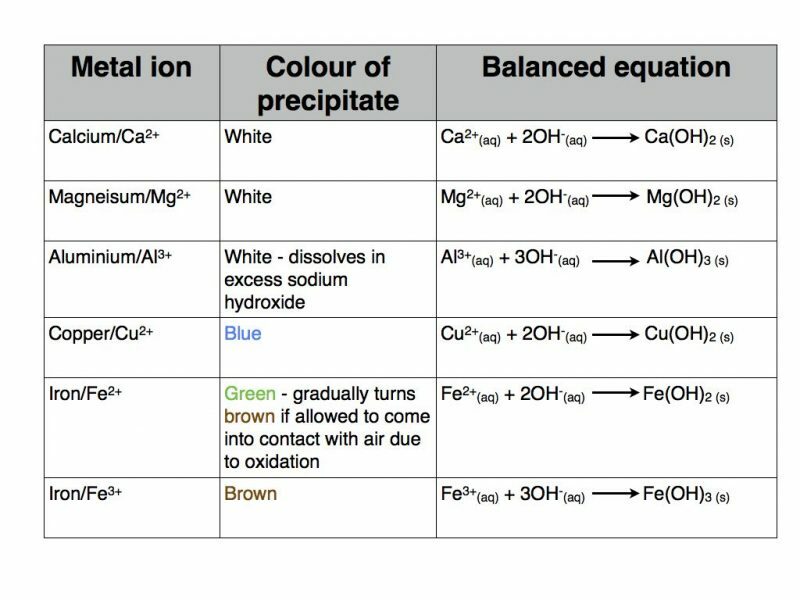 It is very important that you give the exact precipitate colours listed here. A common mistake is to refer to the silver bromide precipitate as “creamy” (which will be penalised) rather than cream (which will gain credit). In practice, the colours of the silver halide precipitates can be easily confused. Ammonia can be used as an additional test. Silver chloride will dissolve in dilute ammonia solution. Silver bromide requires concentrated ammonia to dissolve and silver iodide is insoluble in concentrated ammonia. This completes the required chemical tests for GCSE chemistry. In my next blog post I will go through the chemical tests in A Level Chemistry. 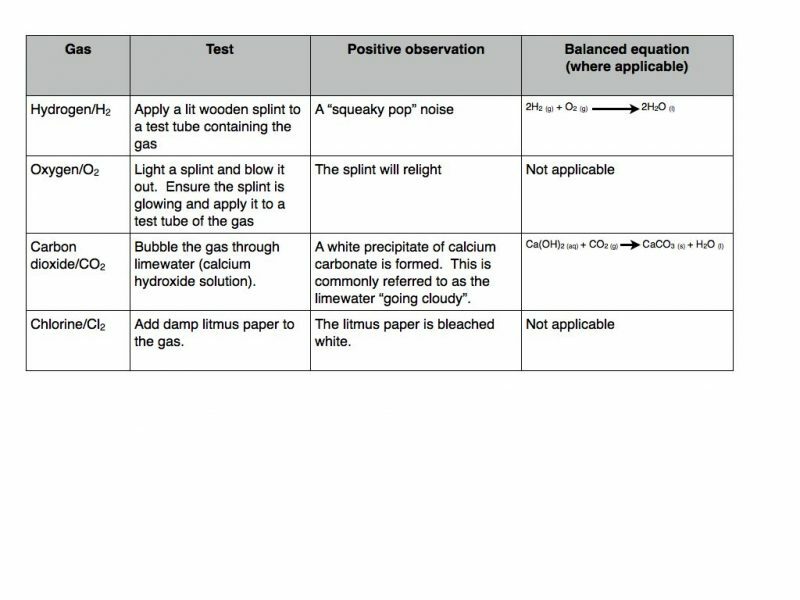 This entry was posted in GCSE Chemistry and tagged Flame tests, gas tests, GCSE chemistry.